Yes, You. How would You react to such a declaration? In contradiction to all our sensibilities, Ivory exists and is slated for release this December. We were incredulous. It’s hard to look at attempts at seduction such as “Today’s ambitious. Tomorrow’s power couples.” without stifling a snort. But apparently, Ivory is real, and plans to screen and connect a (curated) list of high-rollers through yacht parties and VIP events. Though it parades itself as a dating app for anyone “ambitious”, its demands for “profession” and “alma mater” paint a startlingly different picture. We couldn’t quite shake off the feeling that it was an elaborate hoax, or a social experiment – if it were true, it was rather, well, elitist. After all, Ivory seems to be be a runway for prejudices to manifest, where potential partners are judged and screened first based on their ambitions. Though prejudices exist within any app, and Ivory argues that “a polytechnic-educated supermodel” is equally likely to be admitted, Ivory perpetuates elitism to a higher degree. It evaluates if users are sufficiently “ambitious” or “high-achieving” – and as illustrated, it already has a strong focus on educational attainment and high-flying, glitzy careers. I mean, specifying a model’s education level is extremely telling of Ivory’s actual standards. These are some of the criteria for joining the app’s list of members. Being in a school well-acquainted with allegations of elitism, we decided to send out a survey to Rafflesians, to uncover their opinions on the app, and the possible reasons for these views. Based on the responses, most Rafflesians would likely not use said app. In the conversations that followed, however, we quickly realised that this Ivory business holds more than the speculation of elitism, and is more complicated than it appears to be: Underlying our disapproval of Ivory is a layer of hypocrisy, given the traditional existence of “elite” dating, and the disconnect between the perception of social standing vis-à-vis other social divisions such as race, religion or personality. Responses are ranged from 1-5, with 1 being “extreme disapproval” and 5 being “extreme approval”. Though a neutral response is most common, the higher distribution of responses from 3-1 suggest general disapproval towards the app. For the longest time, ‘elite’ dating has been a practice prevalent in society. Studies point out that so-called “elites” tend to associate and date within the same social circles. This aligns with the findings in our survey, where 61% seek romantic partners with a similar education level. Objecting to Ivory, which only seeks to propagate these existing trends, seems rather hypocritical, for we have never singled society out for the same practice. Despite this, a substantial number of us express discomfort at the idea of creating a dating app solely for the elites. Perhaps, this has to do with the concrete, targeted nature of the app, which explicitly excludes individuals, whilst in real life, these divisions are fortunately implicit – our environment, workplace, and common interests. Furthermore, an endless stream of Korean Dramas and Western movies espouse a truism: love “transcends all” and brings together people from vastly different social standings. They tell us that class is a minimal issue, and we certainly like to believe that but the very existence of Ivory, which is based on class differences, says otherwise. This is likely where our discomfort with Ivory arises – it seems to leverage on an inconvenient truth that class differences matter in dating, and that we are already filtering our choices as such. Respondents could choose from a checklist of responses, and though Personality far outstripped other criteria, Similar Educational Background (second criteria from top) was an extremely popular choice too. However, in our survey, responses show that we look for partners based on many different traits and sets of filters. Other real-life “filters” can include personality, interests, race or religion. But in Singapore, dating based on these criteria are generally less controversial – or at least far less likely to draw criticism for dividing and otherwise negatively impacting society. Puzzled, and (tiresomely) questioning, we then wondered: why is dating by education level or social status so criticised in comparison to other factors like race, for example? The fact that 80% of total marriages in Singapore were intraracial in 2014 did not generate public outcry. We do not condemn those who choose to date or marry within the same race as racist. Rather, it is a reasonable preference. 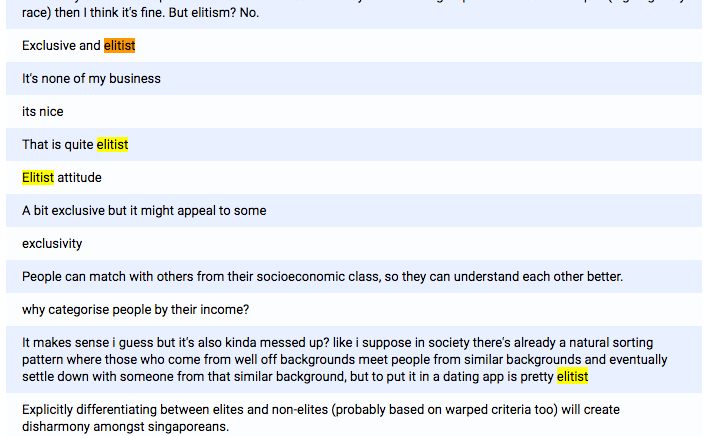 Conversely, actively choosing to date within our social classes is instinctively denounced for being “elitist”. A look at survey responses (explaining their reaction to an “elite” dating app) show general disapproval of Ivory, mostly for being elitist. We have two possible reasons to explain this. The first is that we live in a country where meritocracy guides and defends our decisions, which lends great importance to notions of fairness and social mobility. This is perhaps the reason why we are afraid to explicitly distinguish others by social classes, especially via a rigid “filter” on a dating app: it clearly shows the inequality that has long been justified by meritocracy. And that opens a can of worms on the flaws of meritocracy. Another possible, and closely related, reason for this greater acceptance is that personality, race or religion are personal and communal attributes. They shape our perspectives, behavior and character on an individual level, and are often fixed traits. Going about our daily lives, we don’t rank people by personality, or deem that funny people are superior to serious ones. Even if we do have a preference, these individual interpretations of superiority are largely subjective. On the other hand, attributes such as education and career correspond directly to our social standing. These indicators are often quantitative and resistant to personal perception. This leads to social standing being indisputable in terms of the superiority one of a higher social standing has over others. Anything above the middle class, for one, emerges as “winners” in the socioeconomic sphere as a result of education and career. By zeroing in on “elites” who fall into more privileged classes, we emphasise stratification and division in society that conflicts with the idea that meritocracy is about mobility and equality of opportunities for all. With apps like Ivory, that only admits applicants based on career and education – and hence social standing, to a large extent – we confront the truth that meritocracy disempowers those whose aspirations towards social mobility are dashed. Similar attributes, to varying extents, are generally seen to be part of the “partner selection algorithm”. We started off questioning if Ivory could find an audience amongst our schoolmates, and if approval of Ivory was a sign of elitism, or just another way of screening particular preferences. 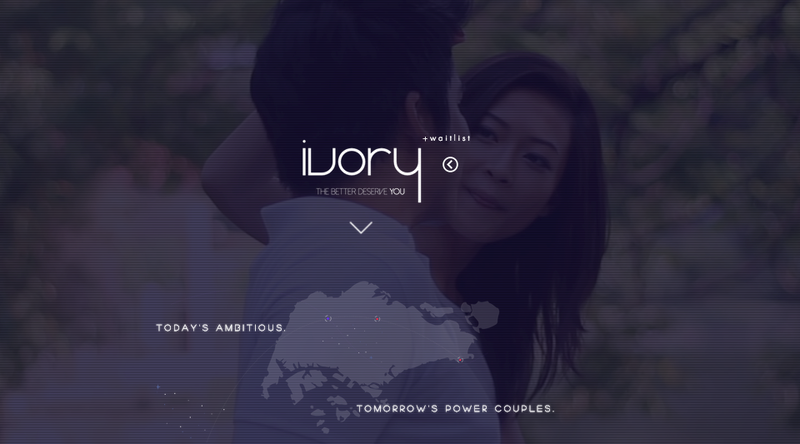 If the 53% of respondents who would seek partners with similar education level through a dating app are any indication, there is an audience for Ivory. It is amongst us, a largely upper-middle class institution generally viewed to have high education standards and promising careers. However, as many of us have commented in the survey, this is a fundamentally problematic way of filtering and dividing society. We can certainly argue that education and career are just another set of filters that narrows our romantic choices. However, in choosing to embrace Ivory, we embrace exclusivity and perpetuate the disempowerment of ambitious, hardworking individuals. It is a runway for elitist tendencies to manifest. Yes, perhaps education and career are “just another set of filters” – but they are also the filters of privilege and class, discriminating and barricading itself into a restrictive barrier; turning away those without the Ivory platinum card. And it is the overwrought, impractical tower that first topples, jewels and ivory with it.